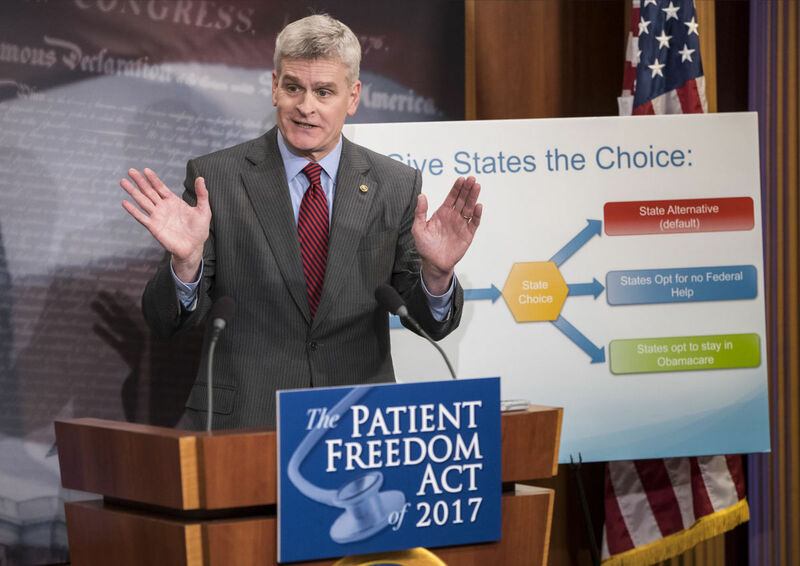 WASHINGTON (AP) — Senators Bill Cassidy (R-LA) and Susan Collins (R-ME) say they’re putting finishing touches on legislation that would let states keep President Barack Obama’s health care overhaul or design their own programs. The two Senators are pushing their Patient Freedom Act of 2017 Bill as President Donald Trump continues to recommend Congress nullify the health care law and enact a Republican version. President Trump has often said parts of Obama’s overhaul, he would like to keep intact, like requiring insurers to cover people with pre-existing medical problems. Cassidy said their plan will allow some power from Washington to be shifted to the state governments. WASHINGTON (AP)— President Donald Trump wants Congress to move quickly this week to dismantle the Affordable Care Act, but congressional Republicans are far from a consensus on a repeal-and-replace effort that won’t leave millions of their constituents without insurance. On Monday, two senators who have cautioned colleagues to delay repeal until they’ve settled on a replacement announced an alternative plan — “Patient Freedom Act of 2017” — to give states the choice to keep the health care law or be granted flexibility to expand Medicaid and other coverage options. That alternative, from Sens. Susan Collins, R-Maine, and Bill Cassidy, R-La, runs counter to the plans on the table, including one from Trump’s health secretary nominee Tom Price, known as the “Empowering Patients First Act.” That would offer tax credits, encourage the use of health savings accounts and urge states to develop high-risk pools. “I’m not saying that it’s perfect, but it’s important that we put specific proposals on the table,” Collins said on the Senate floor about the plan. Repeal without replacement or repeal with a delay, as some lawmakers have suggested, would send insurance markets into a tailspin, she said. In addition to Price’s plan, Republicans have considered House Speaker Paul Ryan’s “A Better Way.” Ryan’s plan would also offer tax credits to help people pay for insurance, and he wants to overhaul Medicare, which Trump has promised not to cut. Complicating the situation, Trump’s pledge for “insurance for everybody” conflicts with what many fiscal-minded Republicans intend to do — and the yawning gap between congressional conservatives and their president on the issue is something Democrats are eager to exploit. “I guess we have to wait for President Trump’s Twitter to figure out what the Republican plan is going to be,” said Rep. Ben Ray Lujan, D-N.M. He is a member of Democratic leadership, which has sought to highlight Republican contortions over finding a solution. “They’re all on different pages and when they try to clean it up they contradict each other all over again,” Lujan said. Although the new Trump White House website does not list health care as one of the administration’s “top issues,” and it didn’t come up in his inaugural address, Trump addressed repeal in one of his first acts as president. He signed an executive order Friday that reiterates his administration’s intent to seek “the prompt repeal” of the 2010 law that has extended health care to 20 million Americans. But the executive order itself notes that regulations can be changed only through the traditional process of “notice and comment,” which can take months or even years. And it will require his political appointees to be in office, which has yet to happen, particularly as Senate Democrats look to slow the nomination of Rep. Tom Price, R-Ga., Trump’s choice for health and human services secretary. Price goes before the Senate Finance Committee Tuesday for a confirmation hearing. Price also distanced himself from Trump’s pledge. He said at a Senate hearing that he was committed to seeing that Americans have “access” to health care coverage, which Democrats point out is not the same thing as guaranteeing coverage. Many of the Republican plans would limit guaranteed insurance to people with continuous coverage. None of the plans have come up for a vote, nor have they been “scored” by the nonpartisan Congressional Budget Office, which provides Congress with economic and budgetary analysis, Levitt said. Sen. Bob Corker, R-Tenn., who has been among a number of senators urging colleagues not to uproot the law without offering an alternative, acknowledged the disarray, but said he expects Republicans to coalesce around a plan now that Trump has been sworn in and his team is moving to Washington. Republicans in both chambers voted rapidly for a budget resolution that calls for a repeal plan to be delivered to the White House by Jan. 27, but that deadline is widely viewed as a moving target because of Republican qualms about moving too fast to overturn the Affordable Care Act without an alternative. “Before we take this plane in the air I want to know where we’re going to land it. Right now I’m not sure where we’re landing it,” said Rep. Charlie Dent, R-Pa., one of nine House Republicans who voted against the budget resolution. Ryan has promised a “full, exhausting” conversation on how Republicans will move forward on health care at this week’s congressional Republican retreat in Philadelphia. Trump and Pence are expected to attend. This article was redistributed from The Advocate for the sole purpose to reach PenPoint News targeted audience.